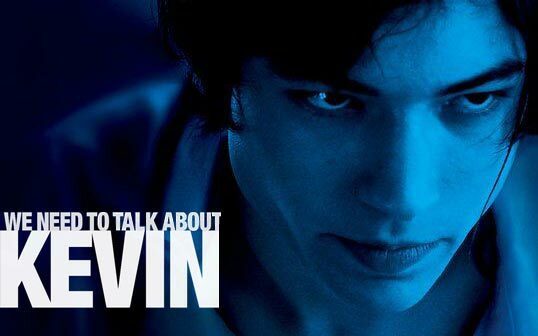 There are few films that hit you in quite the same place as Lynne Ramsay's We Need To Talk About Kevin. Several hours after leaving the cinema I could still feel the characters' presence. This is undoubtedly due to the excellent performances, with Tilda Swinton playing grief-stricken Eva, the mother of an ill-adjusted teenager who goes on a killing spree a few days before his sixteenth birthday. Credit must also be given to all three of the actors who play Kevin at various stages in his life; Rock Duer (toddler), Jasper Newell (young), and Ezra Miller (teen). From the outset the film is visually mesmerising. The opening shows Eva in the midst of a huge food fight with hundreds of people soaked in tomatoes. This sets the tone for the rest of the film, which is suggestive rather than gory with a plethora of red images. The audience is not allowed to forget Kevin's crime, though his acts of violence are never shown on screen, a technique which makes the film far more frightening. Additionally, watching Kevin crush cereal between his fingers, methodically bite off his finger nails or eat a lychee become painful to watch. This muted style serves to highlight Kevin's lacking ability to express himself in any constructive way. We are told Kevin's story through the eyes of Eva, tracking his progress from a grizzly baby to a stubborn, manipulative child, and eventually a withdrawn adolescent. The narrative jumps between Eva's life after the event, and the stages of her relationship with her son. We are witness to the many occasions Eva nearly expresses her concerns to husband Franklin (John C Reilly), but he remains blissfully unaware of Kevin's capacity for cruelty, until the hideous culmination of the film (which I will not spoil here). Suffice to say that there is one scene which is particularly shocking. Swinton delivers a compelling performance, filled with guilt and grief, yet remaining in some way loyal to Kevin. We also get a real sense of Eva's own feelings of being trapped by her first child as she struggles with being a new mother stuck in suburbia. Rather than a film about the impact of contemporary society on the young, which I had anticipated, Kevin is a child who seems vindictive from the start. This film is perhaps most accurately described as a horror story for parents. While not exactly an enjoyable experience, the film is well written, well performed and a definite oscar contender.